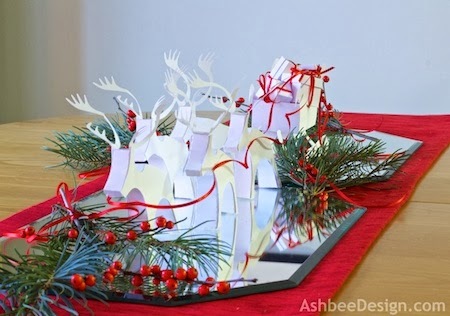 I designed a contemporarily styled reindeer Silhouette cutting pattern. When I designed it, I pictured it in my mind made in all white and paired with a sleigh full of gifts. Because all white items don't show particularly well on the Silhouette store, I first crafted the grouping in more traditional colors. I still knew it would be stunning in all white, and that's what I wanted for my table. I finally had enough time to assemble another set, and this morning I photographed it to share with you. I think my 4 1/2 year old grandson will love it! I do. It is the first Christmas decorating for me this year. I hope to do a little something every day or two, and then be all set to start baking cookies and put up the tree when the kids and their families arrive the weekend before Christmas. For those that are interested in a more traditional paper choice, here is the photo of the other set. If you are interested in making your own, I have a complete tutorial on my other blog. In fact there a three separate tutorials and three separate cutting files. 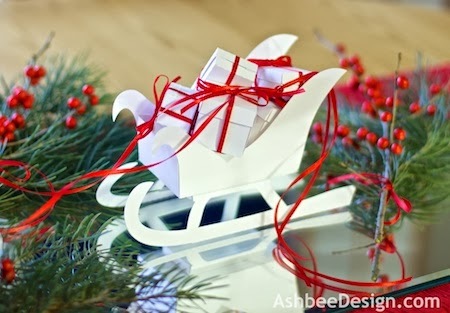 The tutorial for the sleigh is here. Cutting file for the sleigh is here. 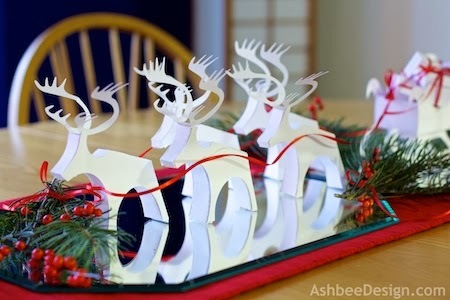 The tutorial for the reindeer is here. Cutting file is here. The tutorial for the presents is here. Cutting file is here . Have fun crafting. It is part of the joy of the season. Thanks Kim! Glad you are enjoying the designs and find them easy to make. I hope they bring a festive cheer to your work place and then later, your home. I enjoy designing them, although not enough time in the day to design all my ideas. You are so very clever. I have to agree with you the white is just stunning although the traditional colours are wonderful too. 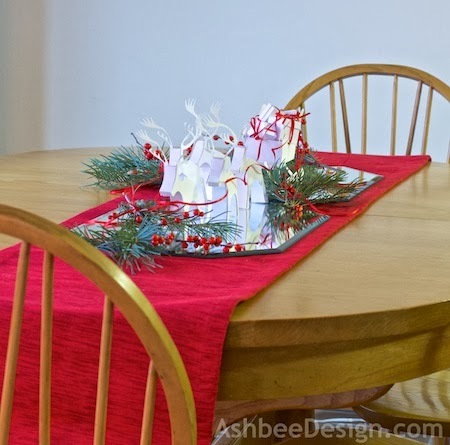 All depends on your decorating theme in any given year. This year I am liking white a lot! Very cool! 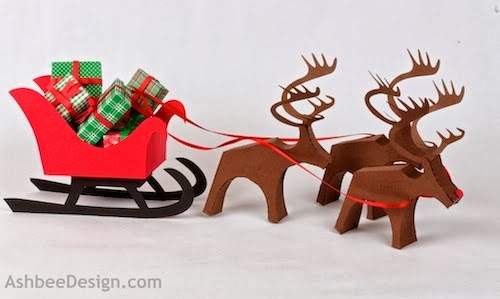 I like the traditional papercrafts for christmas. Might be my Scandinavian genes, but I do as well! Thanks for visiting. Wishing you a crafty holiday. Oh these are super cute!! Pinning! So doing these for next year. Oh my...love these and not sure I could pick which I love the best. I have marked your blog so that I can come back often.